Maybe Facebook is the next LinkedIn – at least, with LinkedIn Groups showing less engagement after the global group functionality change this year, we see raising interest in professional discussions in Facebook Groups. (Join our new group if you haven’t – Boolean Strings on Facebook.) Unfortunately, LinkedIn has duplicated some Facebook functionality and tweaked algorithms in a not-so-helpful manner if LinkedIn wants to stay on as a professional network. Have you seen uninteresting and inappropriate images and posts dominating your LinkedIn stream? Here is why it happens. 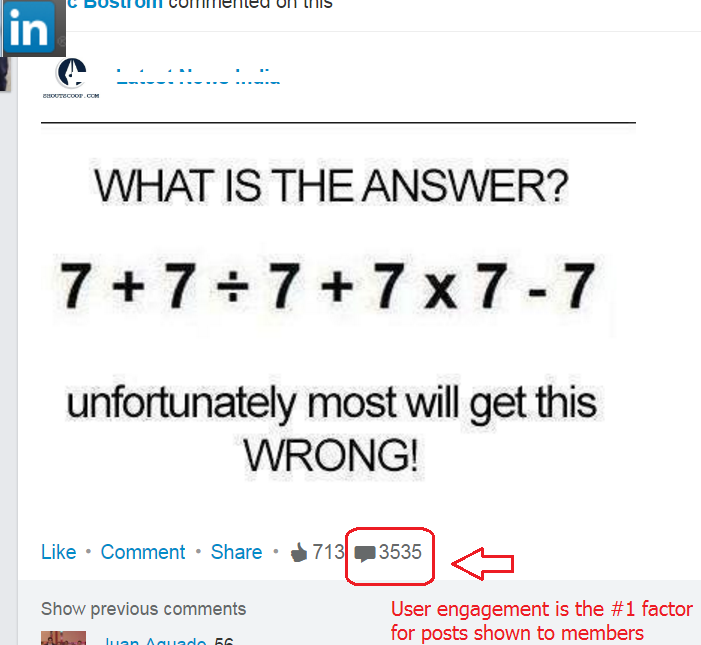 LinkedIn’s algorithm strongly favors posts and shares that get high engagement. Sure enough, if someone sees an inappropriate photo in their stream, they are tempted to say so in the comments. However, every comment adds strength to the share, so the most useless shares stay afloat! (There is also a Facebook Un-professional LinkedIn group where people share “that” type of content among other things – LinkedIn provides plenty lately). The same is also true about LinkedIn publishing system’s algorithm. If a post gets some comments as soon as it’s posted, great, the post will continue to be shown to people in the author’s network, as long as the comments keep coming in. If there’s no “engagement” upfront, the post is left largely unnoticed. Previously LinkedIn notified everyone the author’s network about a new post – that is no longer happening. This switch in the algorithm puts the pressure to share posts and engage others on the author vs. LinkedIn – unless, of course, the author is a LinkedIn-appointed Influencer. Take a note of it. 7+7 / 7 + 7 * 7 – 7 If taking the rules of multiplication, division, addition, and subtraction I come up with 50. That is to do the multiplying and division first the addition and subtraction after. So — 7 + (7/7) + (7*7) – 7 = 7 + 1 + 49 – 7 = 50. I see there’s no other comments, so doesn’t seems to be generating a lot of interest.